Six years ago I made this dark chocolate tart and we ate it around a bonfire. Someone had the bright idea of putting toasted marshmallows on their slice. This Friday I made the same tart but gluten free and we tried something different to top our slices with; amazing local made blackberry ice cream, delish vanilla ice cream and fresh organic homegrown raspberries. My slice of tart was silky smooth, very dark and gone far too fast. We all had seconds, but I was able to save some for Joe and I to enjoy Saturday. It was a big hit with all of the chocoholics there so here is the recipe. Notes: I did run short on the 60% bittersweet Ghirardelli and used one ounce of semi-sweet to get the correct amount; it worked perfectly. Just take your time melting the mixture; I used the lowest heat possible and stirred it frequently. This is a keeper if you love dark chocolate. I am guessing it could be made with semi-sweet chocolate. Drop me a note if you try that! I’m always interested to hear how a recipe works out. Mix all the dry ingredients in the bowl of a stand mixer. Add the butter pieces and blend until they are tiny crumbs. Then add the vanilla and 1 to 2 tsp. water and blend. It should be thick crumbs. Spray a 9 inch tart pan with a removable bottom with cooking oil and then sprinkle with some gf flour; shake to coat. Dump the crumbs of the crust evenly all over the tart pan bottom and press in with your fingers to make a fairly even crust, be sure to push some up the short sides of the pan so it is to the top of the metal and not too thick near the edges. Bake at 350 for 11 or 12 minutes. I did 12 minutes. Let cool while you make the filling. 7 ounces bittersweet chocolate, I like Ghirardelli. Break into small squares/pieces. Put the milk, heavy cream and chocolate in a heavy bottomed sauce pan and heat on low to heat; stir often until chocolate is melted. Remove from heat, whisk well to fully blend and cool a few minutes. Add the beaten egg, blend well. Pour into the tart pan and bake at 375 for 15 minutes. Yeap; 15 minutes; no more than 16 tops. It is a thin chocolate custard and you want it barely solid. It will continue to cook for a number of minutes so stop worrying it is underdone; trust me it isn’t! Serve at room temperature topped with toasted marshmallows or ice cream. The contrast between the vanilla ice cream highlights the smooth dark delish of the tart. SO memorable. I had some cold the next day; nice but honestly it is incredible when it is room temperature; the texture is perfection. Enjoy! This tart is best eaten warm with two or three toasted marshmallows pressed onto the top. Whipped cream or vanilla ice cream is also yummy. 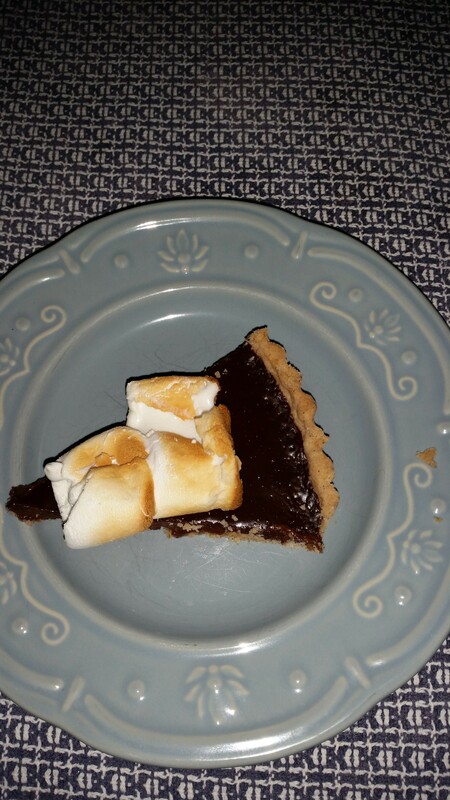 This picture was taken in total darkness with an i-phone and the owner of this slice of tart was ticked off that her marshmallows cooled while the shot was made so she toasted up two more marshmallows and had all four on her slice of tart. This dessert is seriously delicious and really easy to make. If you love dark chocolate this is a must recipe for your repertoire. It can easily be made by you wheat eaters; just use your favorite cookie tart crust recipe. The filling will be the same. Now, go get some good chocolate and make your own tart and don’t eat the whole thing yourself; share it with someone you love! Originally posted in 2014. Silly of me not to repost sooner as it is AMAZING! It is hard to fully describe how delicious every bite is!